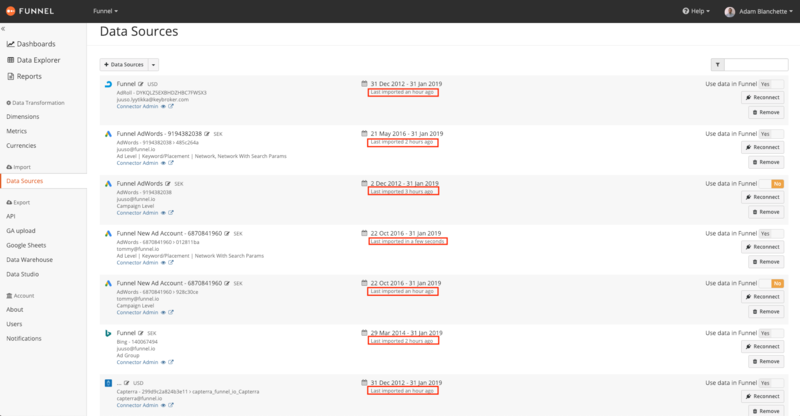 Why does my data differ between Funnel and specific ad platforms when looking at recent dates? Why are there mismatches in recent data? Usually, Funnel pulls data from your connected advertising platforms multiple times a day. The frequency depends on the platform, but most often data from an ad platform is imported every 3-4 hours. For most ad platforms the data retrieved for the current day, and the last few days is only an indication of what the final numbers will be. Depending on the source and other things like your attribution window settings at the ad platform the data will usually be stable after 7-30 days. Google Ads has some more details that describe how this affects their reporting specifically. Why are there mismatches in some historical data? Attribution models: E.g some conversions are reported on the day that the last click before a conversion happened. If attribution window is 30 days, the number of conversions from clicks for that day will not be complete until 30 days have passed. This may also affect other metrics like cost in "cost per order" or similar payment models. Technical: Big ad platforms operate huge clusters of servers on which your data is stored. Sometimes data gets lost and when it is found at a later point in time historical data gets corrected and updated. Fraud-related: In cases where fraudulent clicks are discovered the clicks are removed by the ad platforms and the data is also adjusted retroactively. Business-related: It is not uncommon that advertising costs get updated after being billed. This happens when, for example, transactions/conversions have been taken credit for by two different ad platforms and the user has been billed for them twice. Funnel deals with these issues by using different "time windows” that define how many days worth of data is retrieved daily in each advertising platform connection. These windows vary depending on the advertising platform, but are chosen in order to maintain the best accuracy possible (based on our experience with how far back in time various platforms make adjustments to their data). With the above in mind we would suggest that you view data for the current day and last few days more as an estimate, rather than the final outcome. If you are still experiencing a data mismatch, this article provides you with some useful instructions on how to troubleshoot and report it!